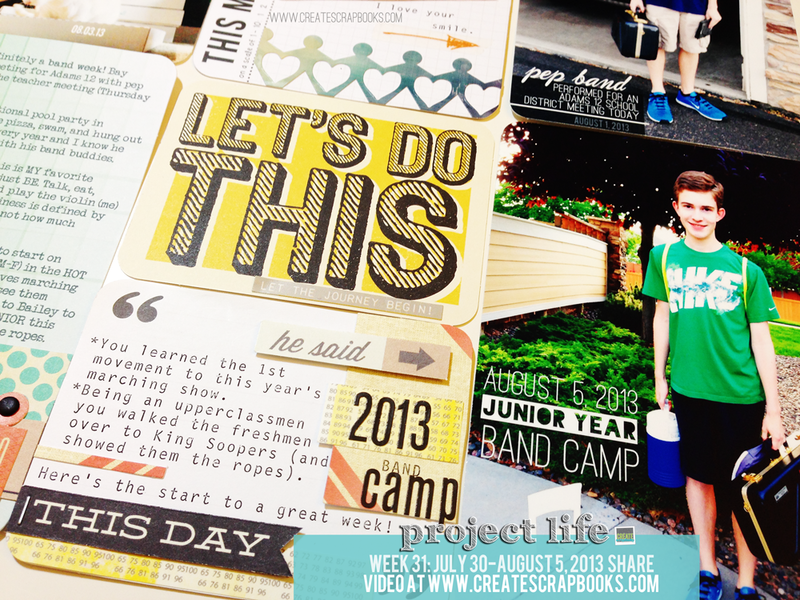 This is Terri Bradford from CreateScrapbooks.com, and if you missed the last video and blog post – I started my own Project Life scrapbooking video series on YouTube here: http://www.youtube.com/user/CreateScrapbooks. 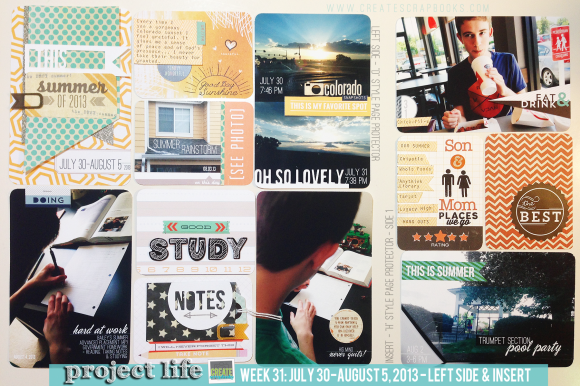 Here’s the second video of the weekly series I created – Project Life Series – Week 31 (2013) Layout Share and Scrapbook Process. I hope you subscribe and comment so we can connect. Click on the little red subscribe box, comment under the video (or here on the blog) and tell me what inspires you. 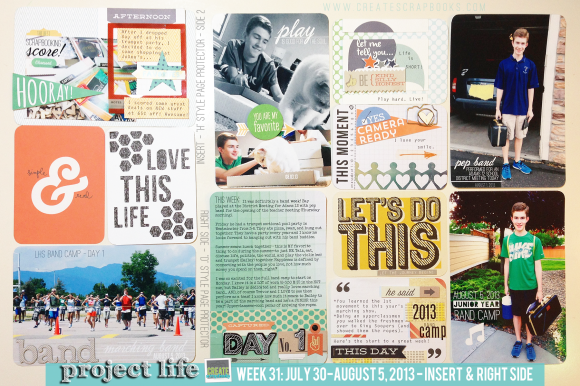 My notes from this week: I am *loving* using the July and August Scraptastic Kits, along with my Studio Calico, Elle’s Studio, and Paper Posies Kits in the mix. Makes things so much easier to open a fresh exclusive kit and put elements easily together for Project Life spreads. I decided to add an H 6×12″ Becky Higgins page protector right in the center of the full 12×12″ D protectors to expand my photos and journaling this week. It helps to have these types of protectors to accommodate the over-flow (and/or orientation) of photos and journaling elements. As you can see, even during the summertime my small family has STILL been knee-deep into high school happenings for my son… like marching band, AP classes (and me toting around my teenager to/from school, etc.) Summer went WAY too fast this year. 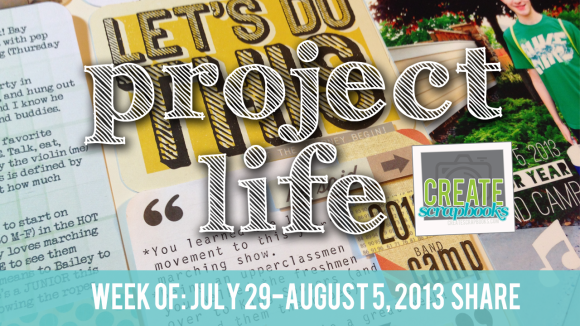 My son is a Junior now and I am trying to get a few of the last week’s of summer Project Life layouts completed. Those will be coming up next in the video series. Thanks to everyone who has stopped by (excited to see my friends from Germany, Australia, Canada, and more! 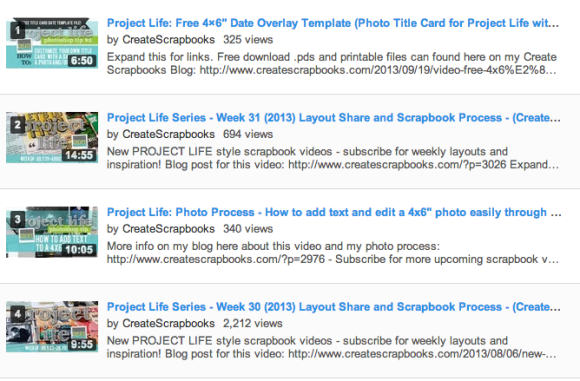 ), downloaded a file or two, sent a message or made a comment, subscribed to my YouTube channel, and has connected with me during the scrapbooking journey! Much creative love to you all. 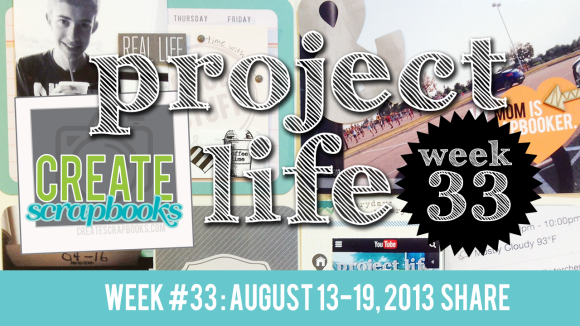 See you next week (or sooner) with week 32. Other Embellishments: October Afternoon star die cut and washi tape, Thickers (Amy Tangerine – White Everyday Chipboard), Prima Camera Paperclip, Theresa Collins He Said She Said die cut sheet, Basic Grey Hipster sticker sheet and transparent elements/die cut pack, Studio Calico wood veneer heart and camera. I thought I would start “Freebie Friday” today. 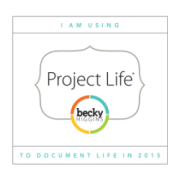 My most recent organizational post was on organization of my Project Life style page protectors from all different manufacturers including larger sized 12×12″, 10×12″, 6×12″ and a few other smaller protectors (you can see the post below or click here to read). I was recently at Michaels checking out any new must-have items and I ran across the 6×8″ Sn@p! Simple Stories page protectors… I grabbed the Variety Pack (10 Pack) and went to the WRMK 12×12″ ringed albums (this is what I have been using for my Project Life so far) to make sure the holes would line up and I could use them as part of my Project Life. They do! I used my coupon and headed home a happy girl. Then, I realized that in light of my newly organized page protector stash that I needed to add these 6×8″ design sizes I just purchased to my system now. No worries… actually I am super excited to incorporate this size into my stash and projects. 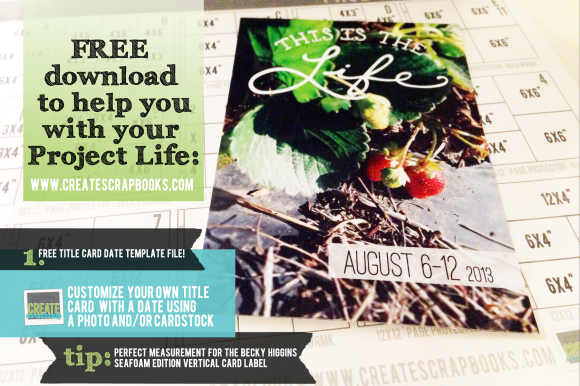 So, today I created another FREE .pdf including just these 6×8″ pocket style page protectors and am sharing that with you (you can download this free along with the whole system – just add them all to your cart and checkout). Enjoy! 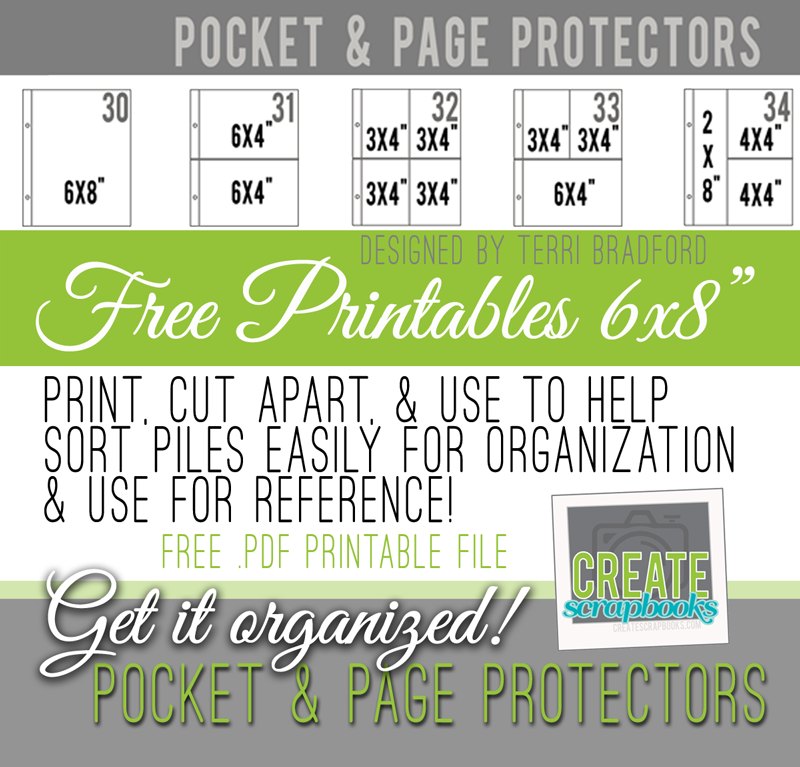 If you want to just cut these apart and add them to your system as needed you can, or you can purchase the .psd files to create your own custom page protector organizational system (and these DO include this latest update of 6×8″ protectors). 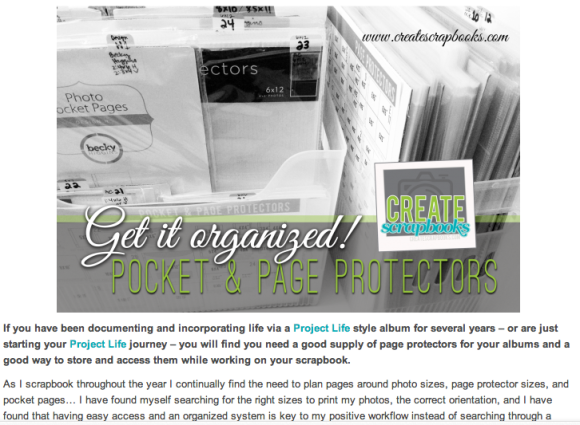 If you haven’t yet make sure you download the larger page protector organization styles (3 packed 8.5×11″ printable .pdf sheets I custom designed) FREE here. 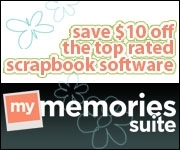 If you love your new system and this post helped you I would appreciate it if you could please share this post with your creative friends, follow my YouTube Channel here, Twitter, pin on Pinterest, or like the Create Scrapbooks Facebook page – see all the links at the bottom of this site as well. Thanks for your support!